Critical thinking with data is a first year University of Melbourne breadth subject that teaches students to become critical users of data-based evidence.It aims to help future journalists, political scientists, sociologists, lawyers, health professionals, psychologists, environmental scientists, business people, engineers, scientists and teachers develop skills in identifying the strengths and weaknesses of arguments and reports based on quantitative evidence, and learn to evaluate reasoning that uses probabilistic ideas. Data-based evidence is found in the media, in academic research and in many aspects of everyday life. 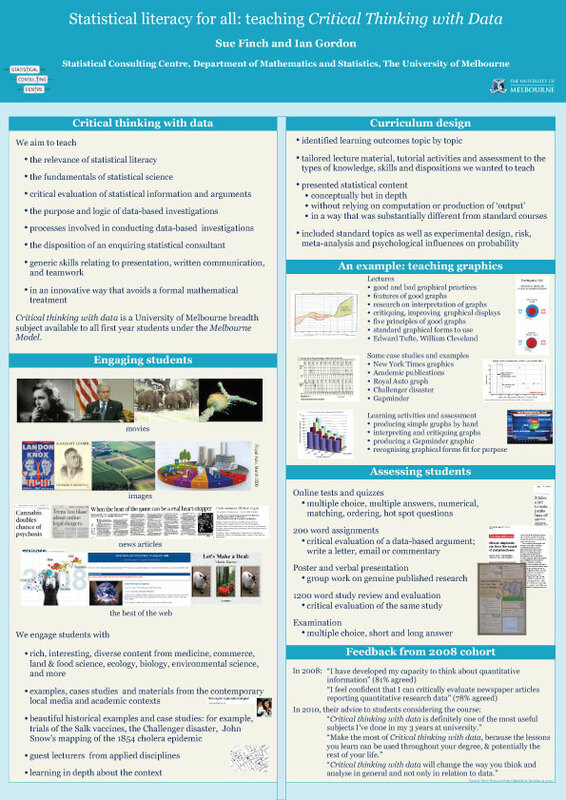 Critical thinking with data examines ways of judging the quality of quantitative information, and the strength of conclusions drawn from it in a wide variety of settings including public opinion, health, sport, legal disputes, and the environment. Critical thinking with data was developed by Statistical Consulting Centre staff members Ian Gordon and Sue Finch, in collaboration with Robert Maillardet and Andrew Robinson from the Department of Mathematics and Statistics, and in consultation with University of Melbourne experts from many of the different disciplines that rely on quantitativeinformation. Critical thinking with data is a first year subject that can be taken by any undergraduate student.Individuals from outside the University of Melbourne are also able to take the course through the Community Access Program(CAP). In 2010, students critically evaluated the representation of quantitative information on the Australian Curriculum, Assessment and Reporting Authority’s (ACARA) My School website. A prize for this work was awarded to Daniel Serra Busquet. ACARA awarded a week-long work placement in Sydney. 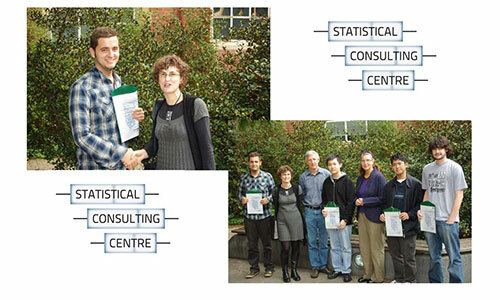 The Statistical Consulting Centre provided financial support towards the travel and accommodation costs of the placement.